Our townhouse isn’t large, so when we got married, The Guy and I naturally talked about moving into a bigger space. But in the end we decided against it because we didn’t want to shake the kids lives up too much at once. People were surprisingly opinionated about it, but most accepted our reasoning and stopped asking. 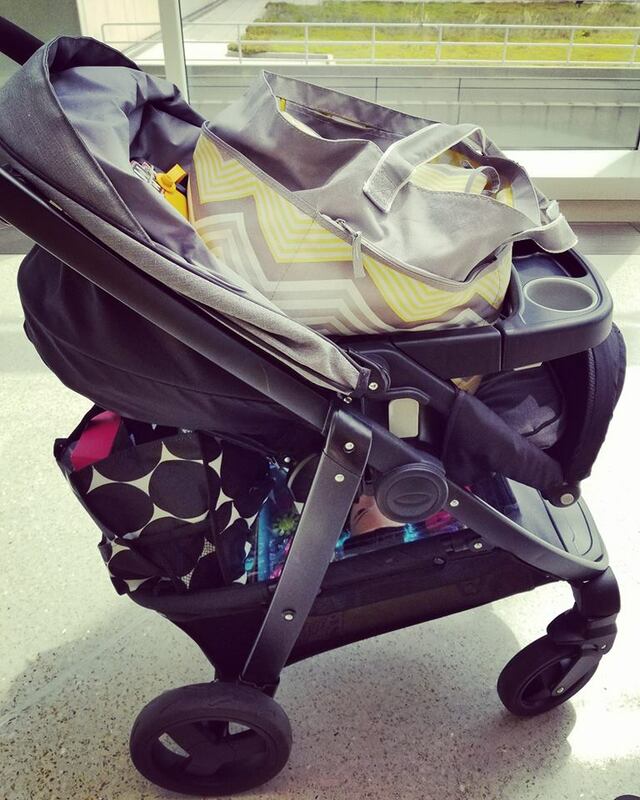 But when I got pregnant, it was amazing how many people began to ask not “if” we were now moving, but “when” we were now moving. Well, to be honest, we did look. But everything we saw was too far from The Guy’s work, or would require the kids to change schools (not an easy task with The Boy Child in special education). Most were too far from the YMCA (which we go to everyday), or the organic grocery store we shop at. We couldn’t find anything available with a school close enough to walk to, or that didn’t need an immense amount of renovations. They also don’t seem to build neighborhoods here, like ours anymore, with multiple playgrounds, walking trails, and duck ponds. 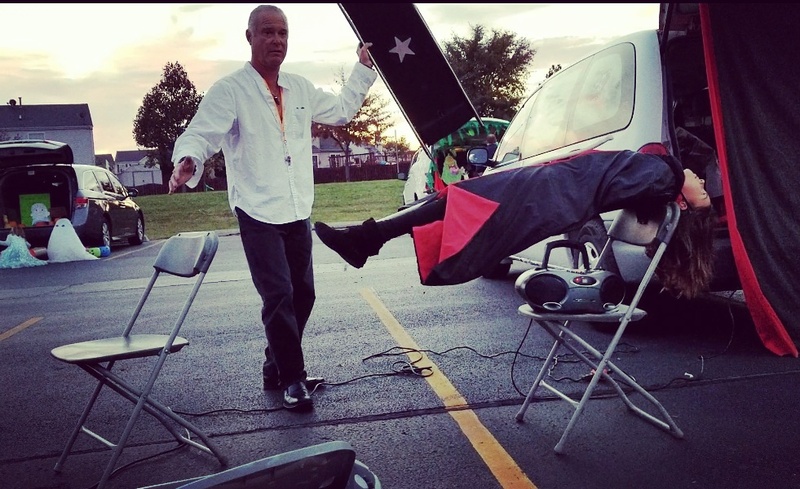 We also couldn’t find a place where the neighbors all get together to make jello shots for Halloween Trick-or-Treating, meet up for an adult game of Capture The Flag, or bring in a magician to make your kid float during the block party. It soon became apparent, that we didn’t like any place we looked at, because none of them were the place we loved. Here. Where we are now. We love it here, and we love raising our children here. The house isn’t huge, but that’s OK. Space isn’t what makes us happy, it’s the life that is lived here. 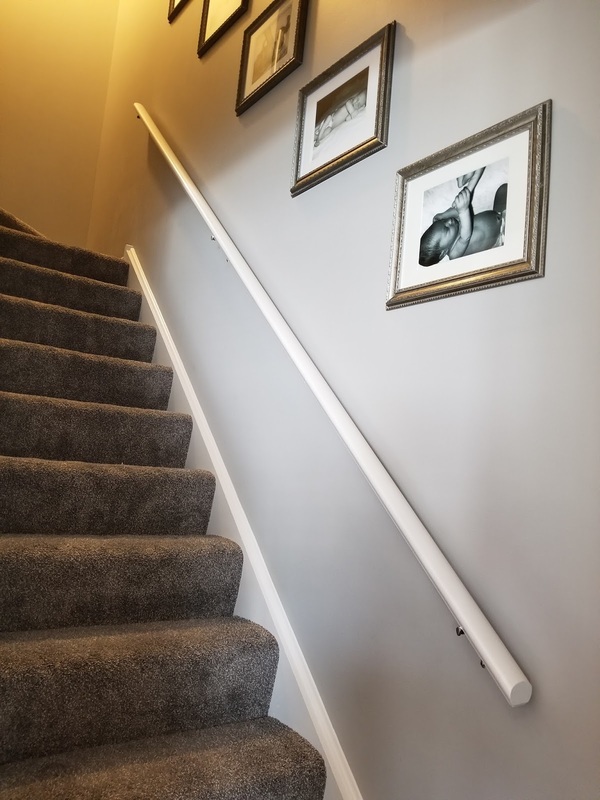 After The Guy sold his house and moved into mine, we used some of his profits to begin renovating things that quite honestly, just needed updating. From the appliances to the hot water heater, the air conditioner and a foundation crack, we were well on our way to sprucing the place up, when it flooded. 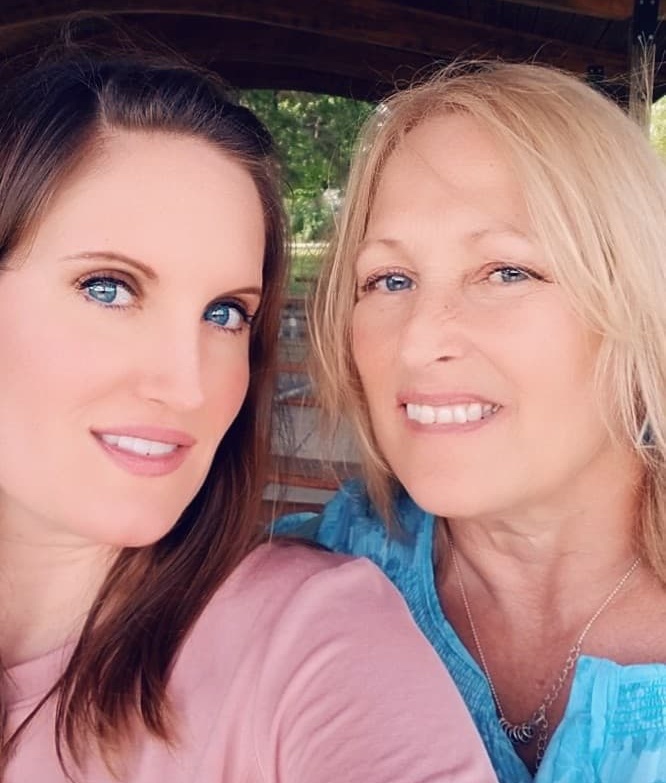 But, in a silver lining, we were able to take the insurance payout, hire cheap labor in the form of friends and tradesmen doing side jobs, and rebuild it into the house of our dreams. 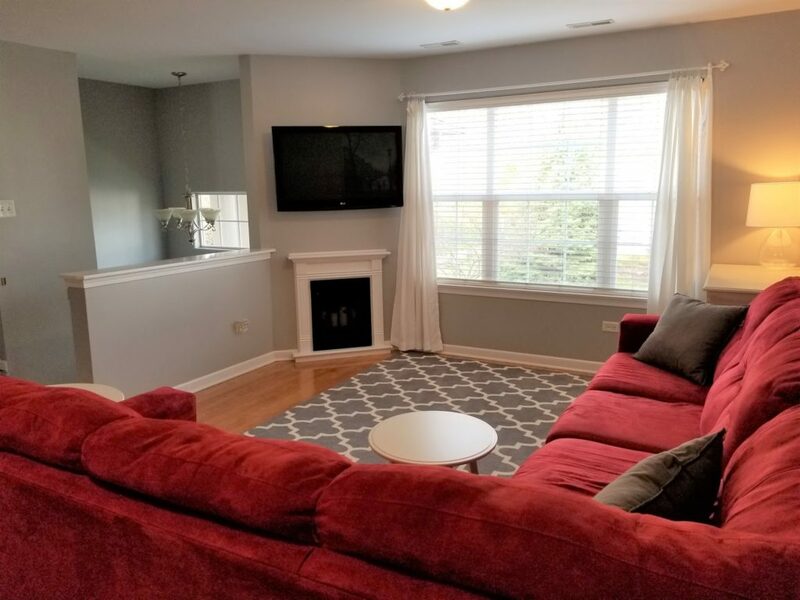 So, since I dragged you all along with me during the flood a few months ago, I’m a little excited to show you what we have done with the place! 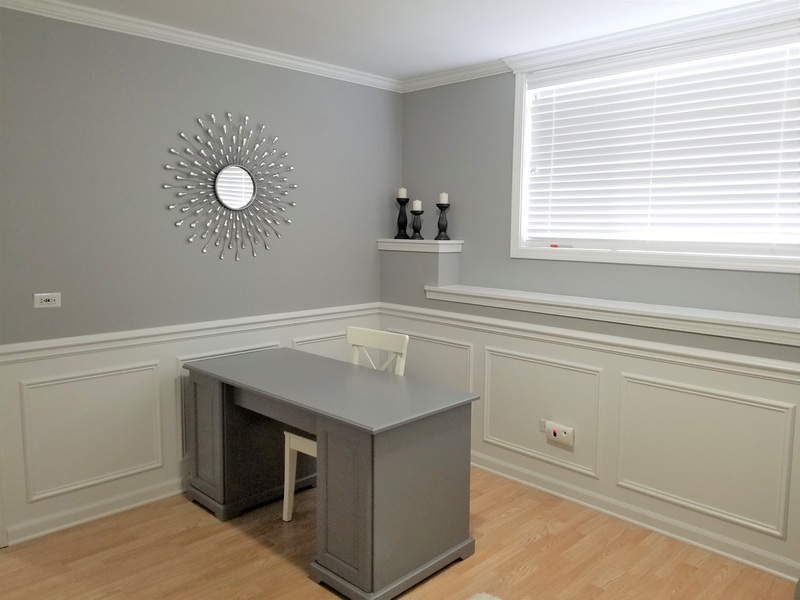 Aside from painting nearly every single room, including all the oak trim, the biggest change was made to my office, and I’M IN LOVE. We had a local carpenter come in and really cater the room to something that suits me. 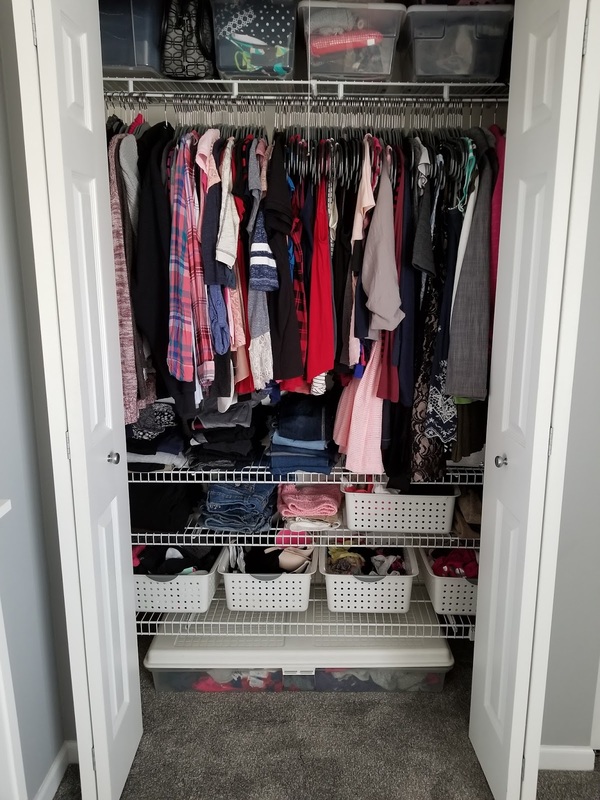 We tore out the closet to create more space, and added clean lines with the walls and crown molding. 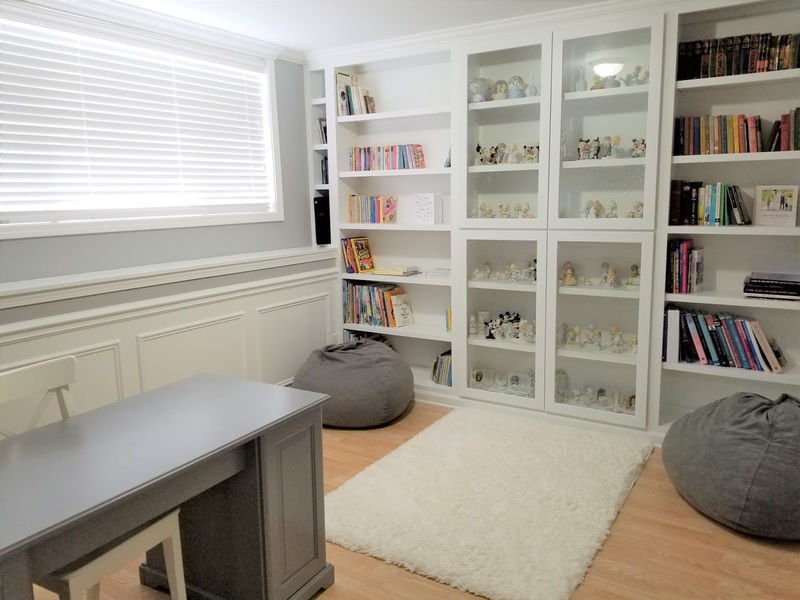 With built in bookshelves, glass door cabinets for my Precious Moments collection (don’t judge), and an incredible deal I found on custom blinds to keep it quiet and dark when I’m writing, it’s by far my favorite space in the house. 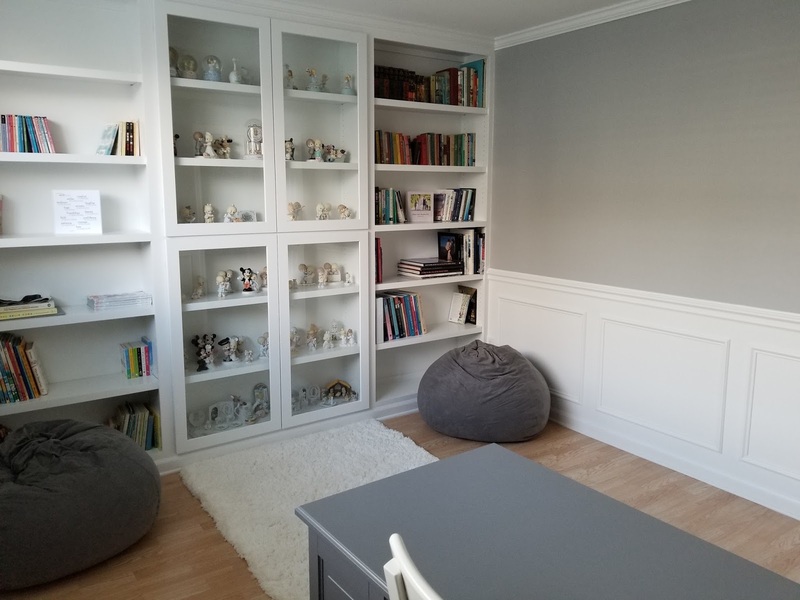 For a finishing touch, we threw a few bean bag chairs in there so the kids can read while I work. 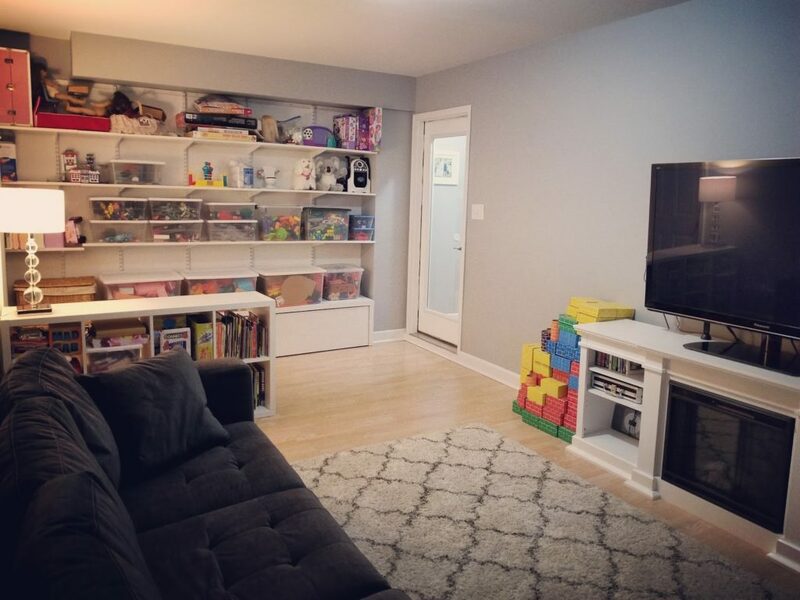 I love it more than any other room in the house, but the kids would argue that the playroom is their favorite. 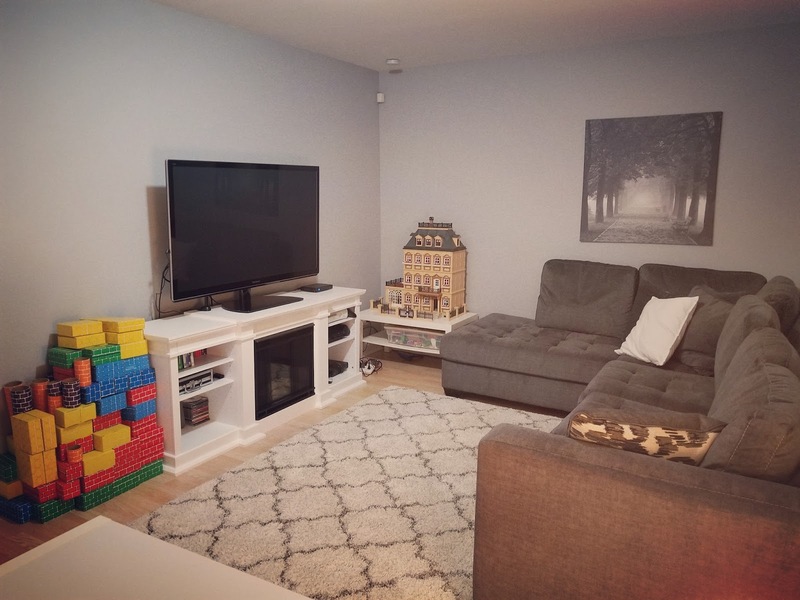 It’s not a big room, but it houses the TV that The Guy brought from his house, an over sized couch for family movie nights, and a plush rug for the kids to sprawl out on with their toys (watch for the Target clearance rug sale you guys, it was roughly 80% off!). 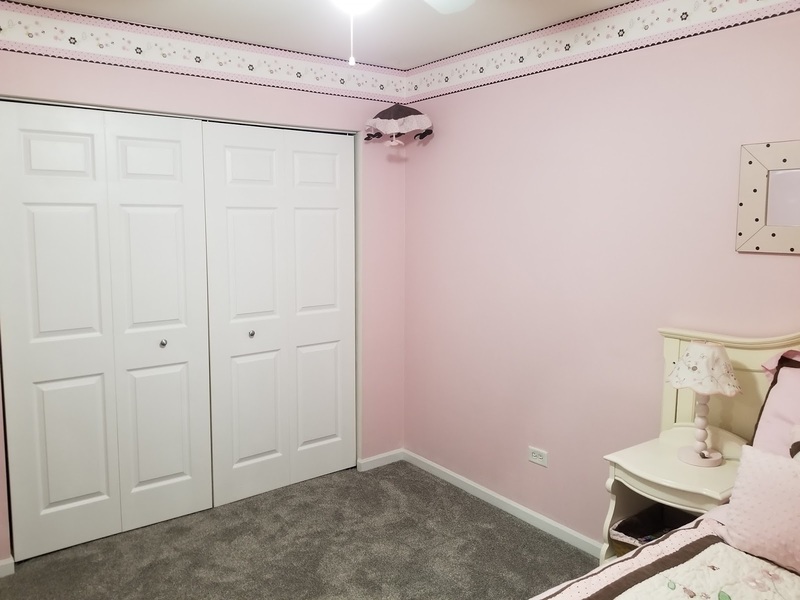 The room itself is a bit awkward due to the fact that it used to be part of the garage (a renovation my ex and I had done when we first moved in), and in order to walk from the remaining garage into the house, you have to walk right through the room. 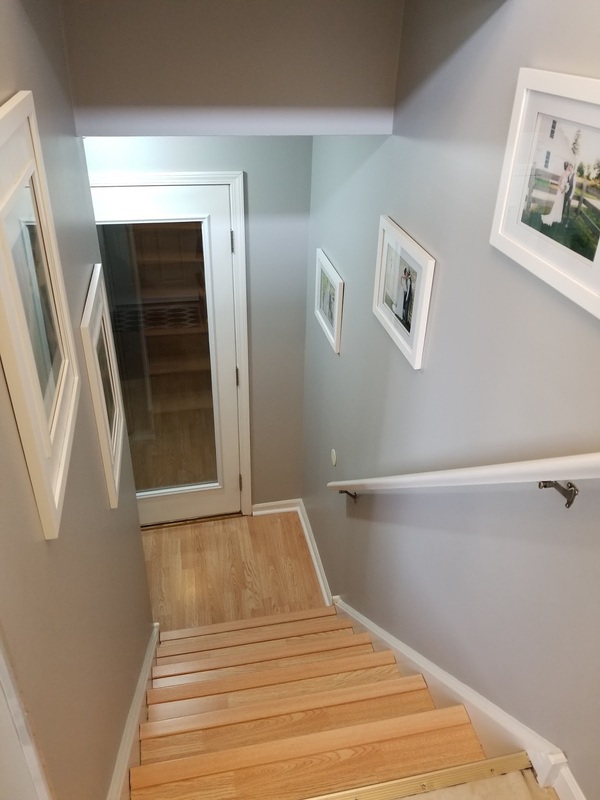 So by placing a shelf by the door, it gives more definition to the walkway from the garage into the house, and also helps to keep many of the toys on one side of the room. In this room, the biggest change was adding heat, which it didn’t have before. And because I had previously swapped out the former garage door for a glass one, the strange little room feels a bit more unified with the rest of the house. 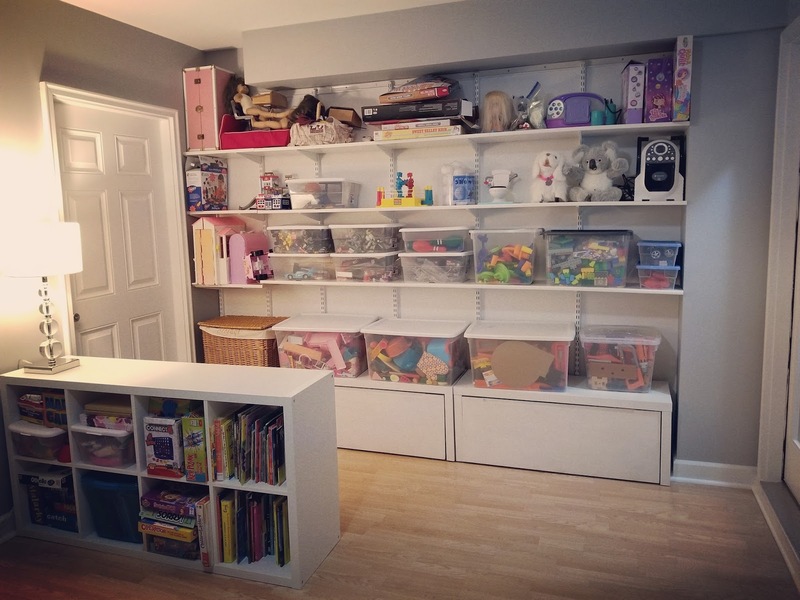 Directly off of the other side of the playroom, is the remaining garage space. We share a driveway with many of our neighbors, and after finding myself sitting in the garage for hours on end while the kids road bikes and the adults chatted, I had turned it into a sitting and BBQ area. 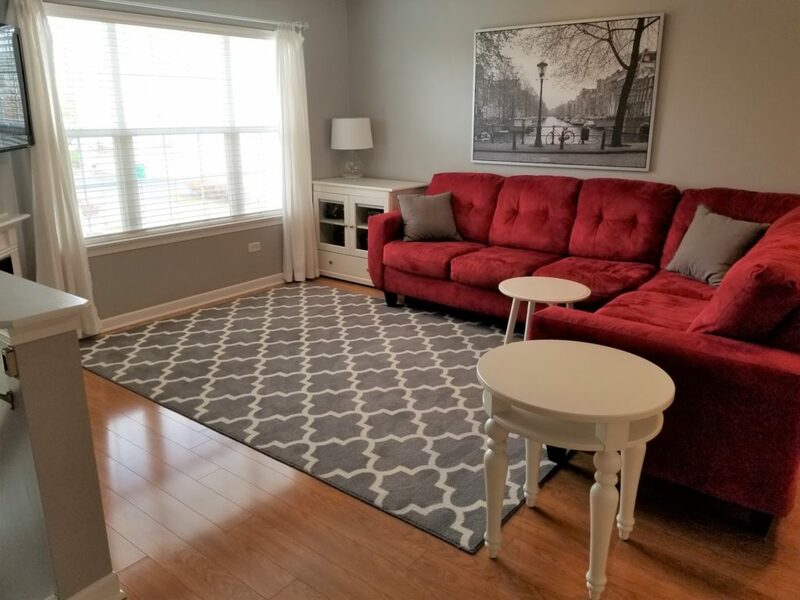 Once The Guy came along (and subsequently gave up his large backyard with a pool), we spruced up our tiny sitting area just a little bit more by adding electricity and lights, a shelf by the door for shoes, and a comfy outdoor rug and sofa. You can’t see it from the photo, but to the right of the seating area there is room for bikes, and cabinets for The Guys tools. And once you close the garage door, everything is protected from the elements, which in my state, is pretty sweet considering the weather we get. You reach the front door. 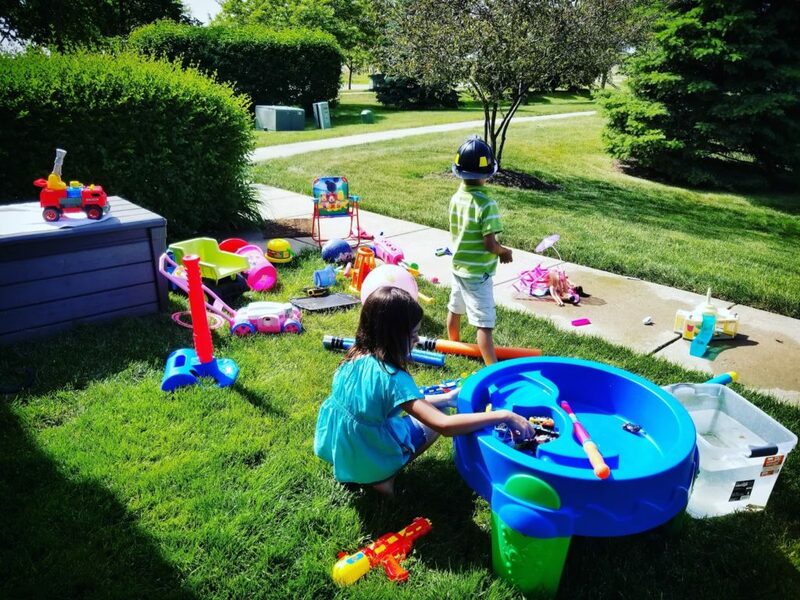 And our small front yard; Pictured with every outdoor toy we own. There’s a very small covered front porch, which is just big enough to hold one chair. 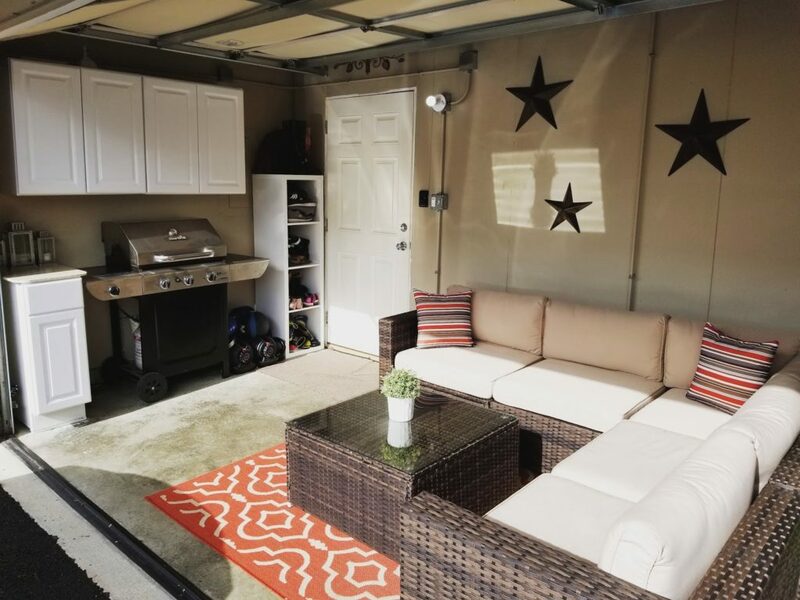 And if you look to the left of that photo, we have an outdoor storage box to hold all the toys the kids play with while I sit there watching them from my one tiny chair. 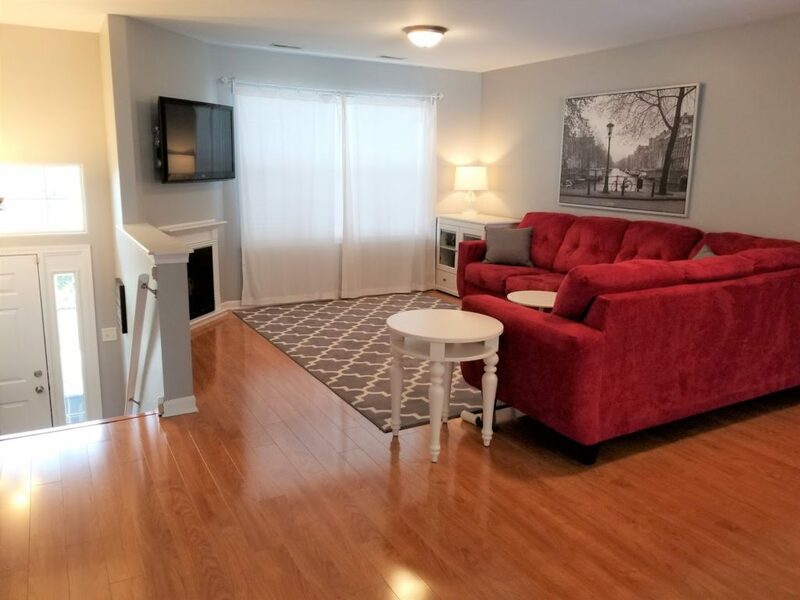 It’s not a lot of space, but honestly we aren’t home very much on the weekends — preferring instead to spend our time around town — so it works for us. And if we do want to give the kids some space to run, there is a large courtyard, three playgrounds, a small waterfall, and walking trails, all within our neighborhood. 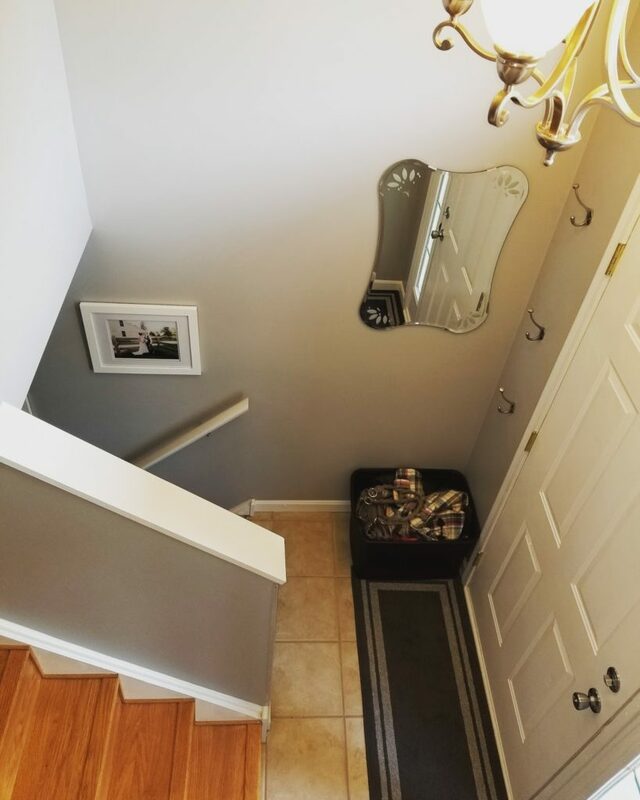 The entryway is very small (small being the popular word in this post), so I had to find space in vertical coat hooks, and a basket for purses and book bags. Heading up another stairway, you enter the second floor, which is our main living area. What should have been the dining room, has instead remained my dance area, although it has definitely shrunk in size! Which is another space where I’m extremely pleased with the turnout. 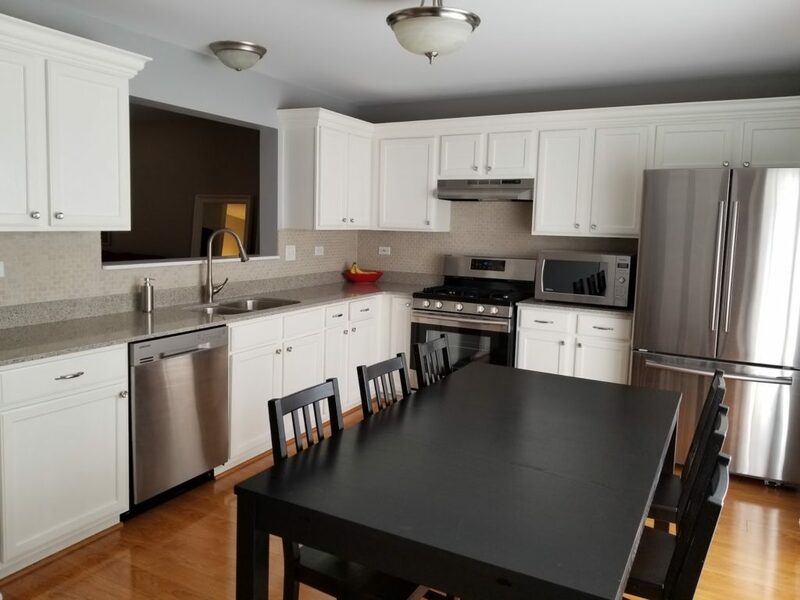 By repainting the cabinets myself and having a neighbor add crown molding on top, it really spruced everything up. The appliances were given an upgrade thanks to The Guy and I merging houses, and the back splash was something I had done a couple years ago when I found 12×12 tile sheets for .49 cents each. 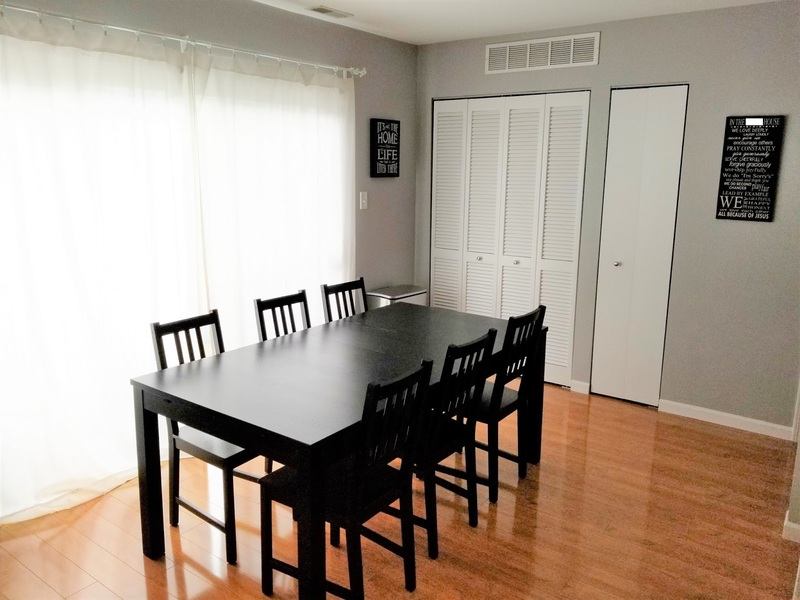 The picture doesn’t do the room size justice, but it’s the only room in the house that isn’t overly tiny, so it was important to keep my previous table, which expands to seat twelve people. It gives us an option to entertain, not that we even own that many chairs. I’m not kidding when I say that I have actually thrown “Bring Your Own Chair” parties. Just behind the curtains is our balcony, complete with a bistro set where I feed the kids as much as possible (you don’t have to vacuum the crumbs off of a balcony!). 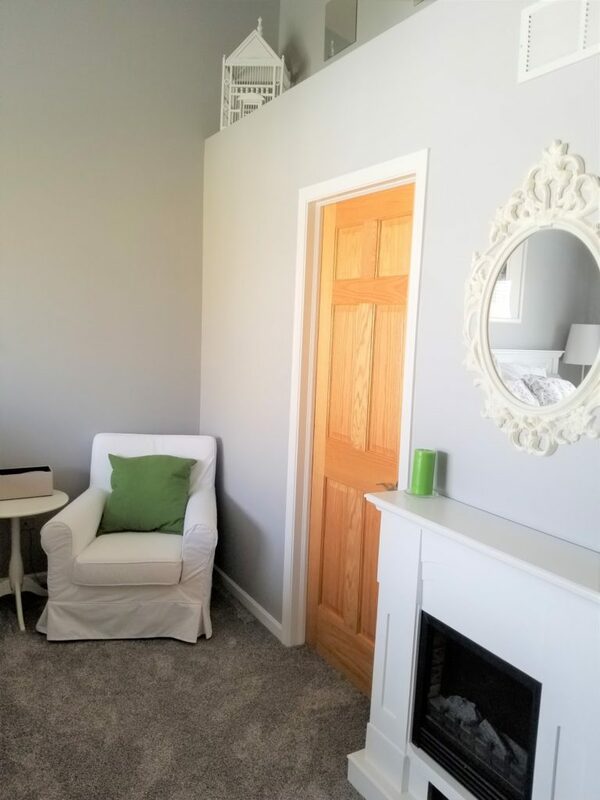 The white doors are a pantry, and a storage closet. He wasn’t totally sold at first, but later admitted that it brought some character to our fairly plain cabinets. (I love him). Off to the side of the kitchen, is a bathroom that is so small, that I had a difficult time even getting a picture of it! If you look to the right, you can see my pregnant belly sneaking into the frame! It’s definitely nothing fancy, but it does the trick. 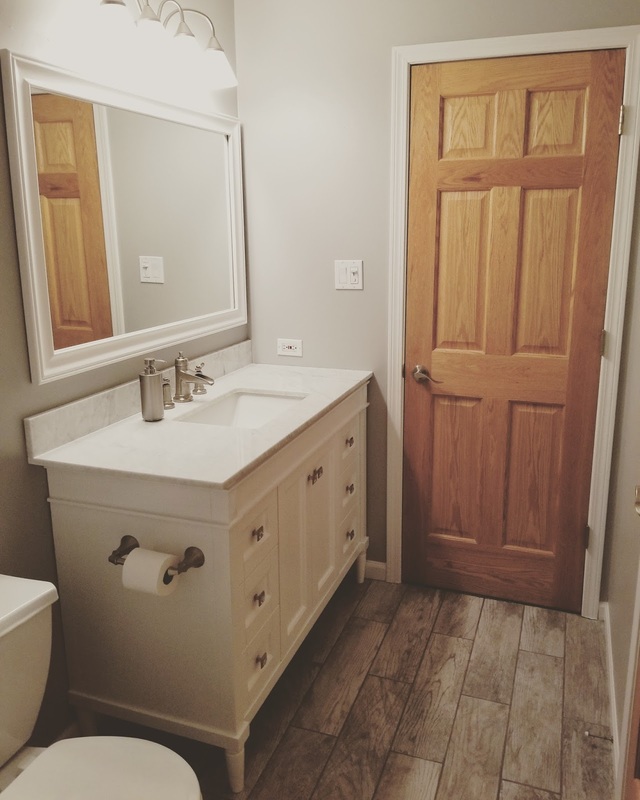 I elected to keep, and paint, the vanity so that we would have the storage, and now The Guy uses it to get ready in the morning while I use the bathroom upstairs. Speaking of upstairs, this brings us to the conclusion of the second floor, so let’s head towards the third. 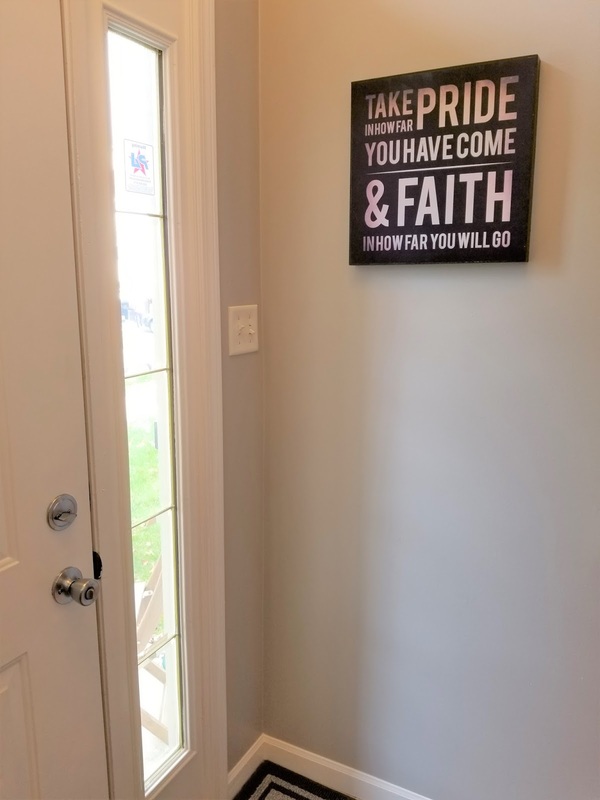 Directly off of the main living area, in the landing of the stairs, live Frank and George, our ferrets. 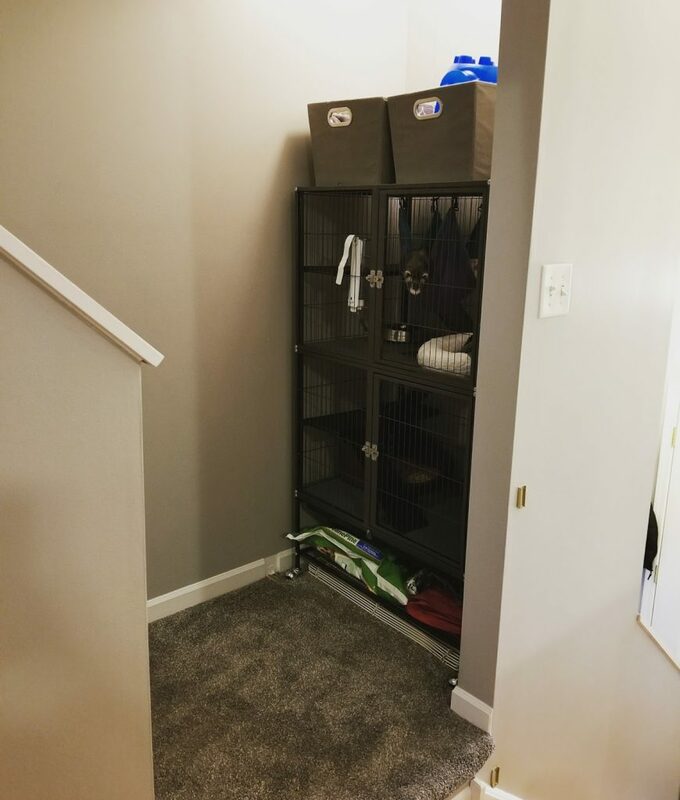 In trying to find the balance of not overtaking our living space with a visually demanding cage, and also keeping our furry family members very much in the center of our daily lives, we opted to refinish a closet into a cozy little pet nook. It’s worked out perfectly! 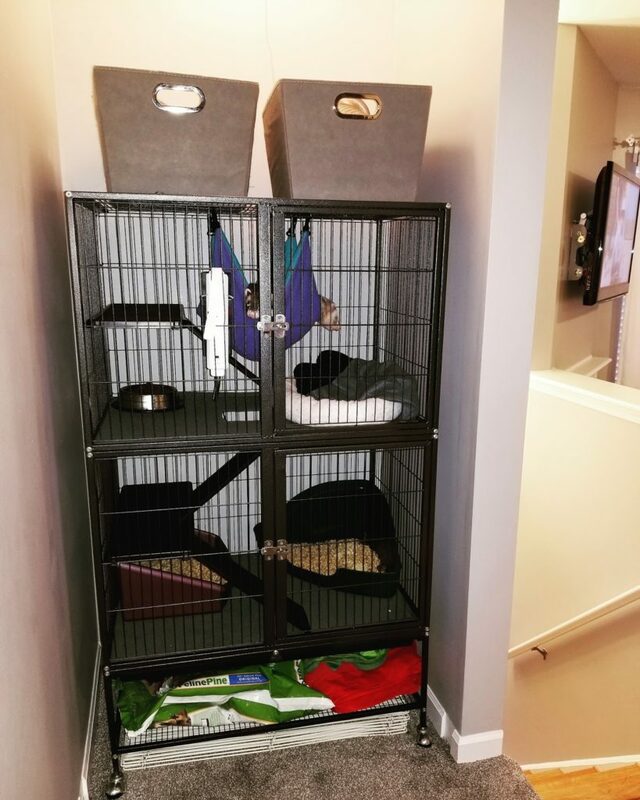 Since the house already has a good number of closets, we didn’t really lose any storage space, and more importantly, when we don’t have the time to let the boys out of their cage, they aren’t forgotten, alone in a room somewhere. On the third floor, we have The Boy Child’s bedroom, which actually used to be a loft before my ex and I enclosed it. 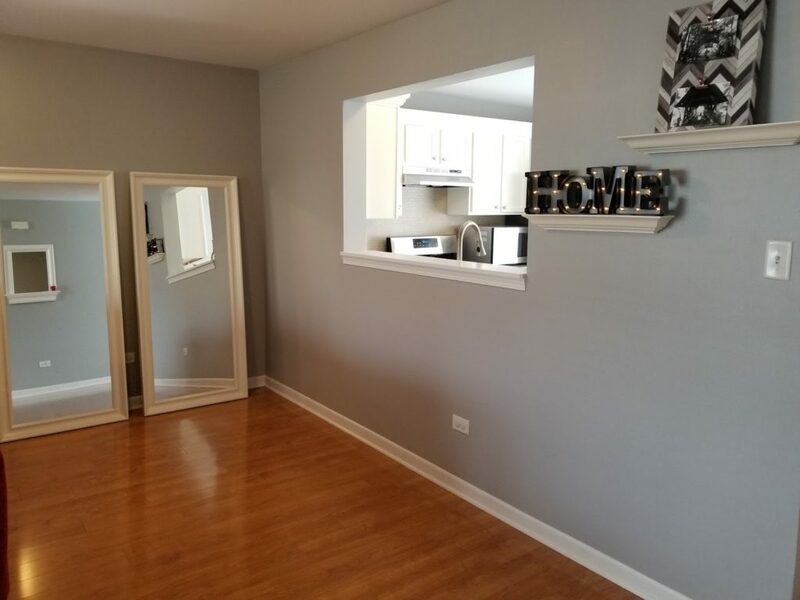 It’s very tiny, so we originally put in glass doors thinking that when we sold the house, it would have better appeal as an office. But six years later we’re still here, and the glass doors have actually worked out wonderfully. 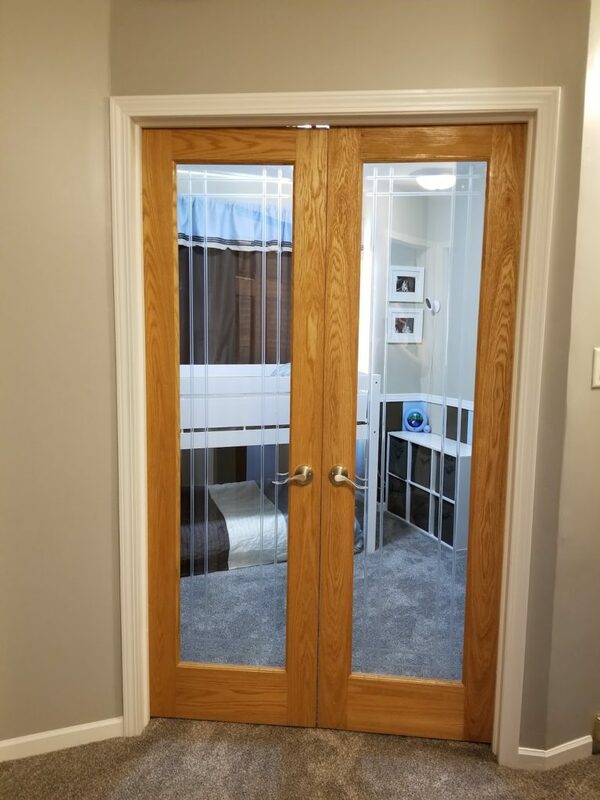 I’m sure that at some point The Boy Child will want privacy, but for now, since his epilepsy tends to cause seizures at night, it’s been great to be able to close the doors for noise control, yet still be able to see him without actually entering his room. 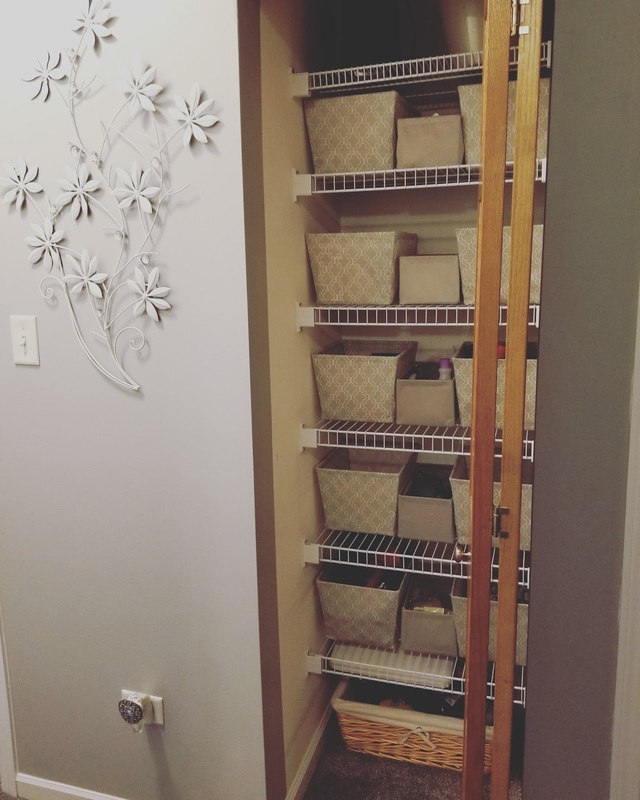 He doesn’t have a closet, so I bolted three cube storage systems together, and then to the wall. It created a surprising amount of space, and was relatively inexpensive. Now, since now we have another boy on the way, we had to figure out the sleeping arrangements. One single bed wouldn’t work for two children, there isn’t enough space for two single beds, and a full height bunk bed — as we learned soon after we bought one — wasn’t safe for The Boy Child, because as I said before, he seizes at night, and could easily fall. 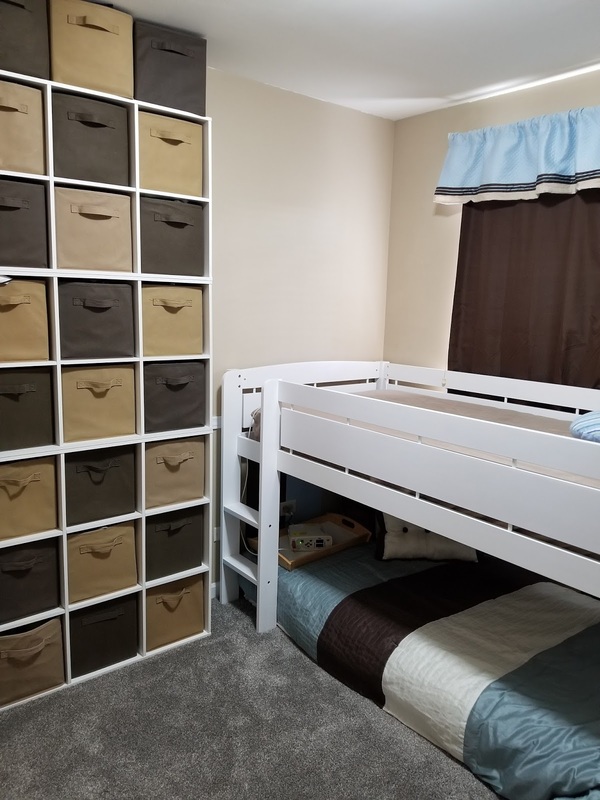 So we ended up going with a loft bed which is low enough to the ground for The Boy Child to sleep on top, and putting a mattress underneath where eventually, The Littlest will sleep. 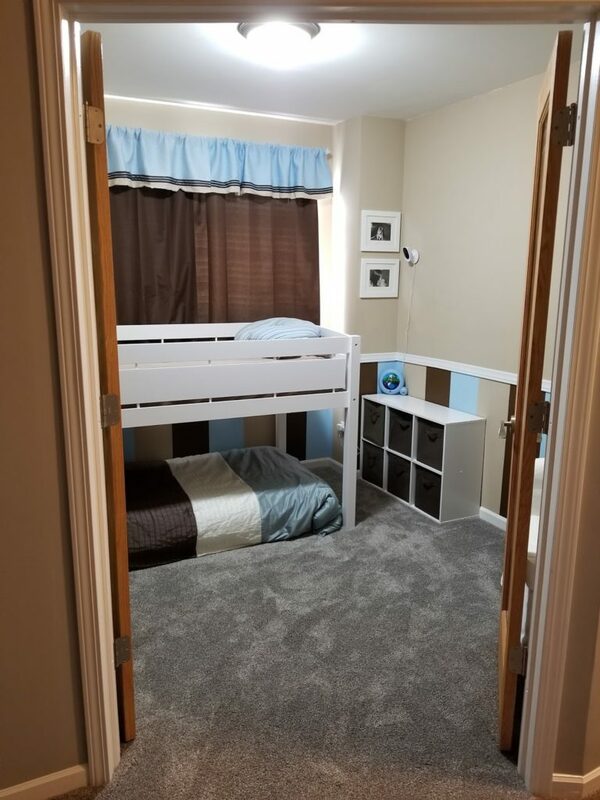 The Girl Child’s room is next to the boy’s, and even though it is the larger of the two rooms, the girl in me wanted her to have the space with a closet. The headboard and the footboard (placed on the side of the bed), are from her crib, which was supposed to turn into a full sized bed. 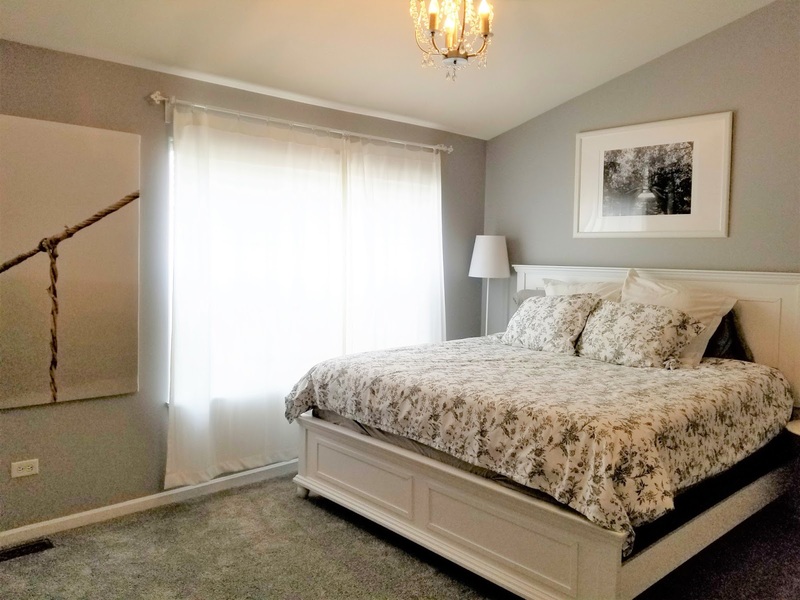 But, the full sized bed was much too large for her room, so we downsized to a twin and used the foot board as a buffer between the bed and the window, since it seemed unsafe to let her have her sleeping so close to the glass. 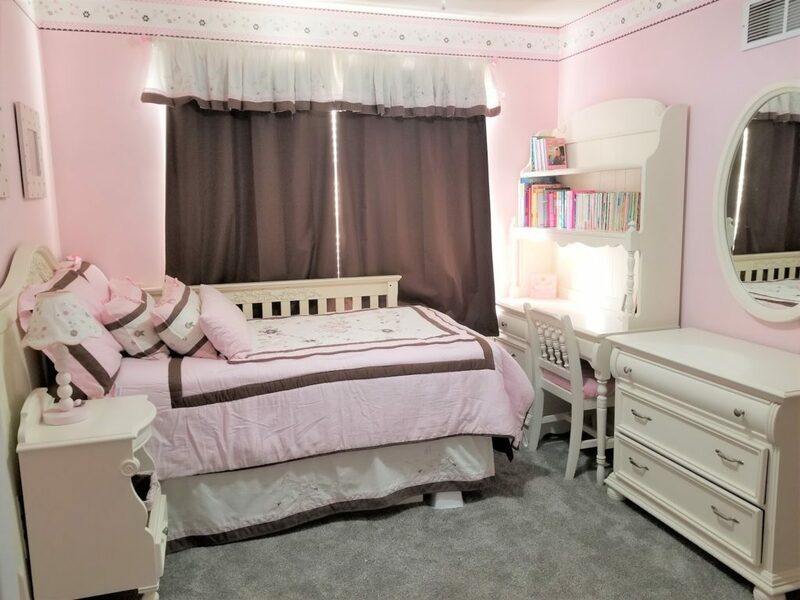 … A design choice which was done in an effort to accommodate her only request, of having “empty space” in her room. I never said she was a normal kid. 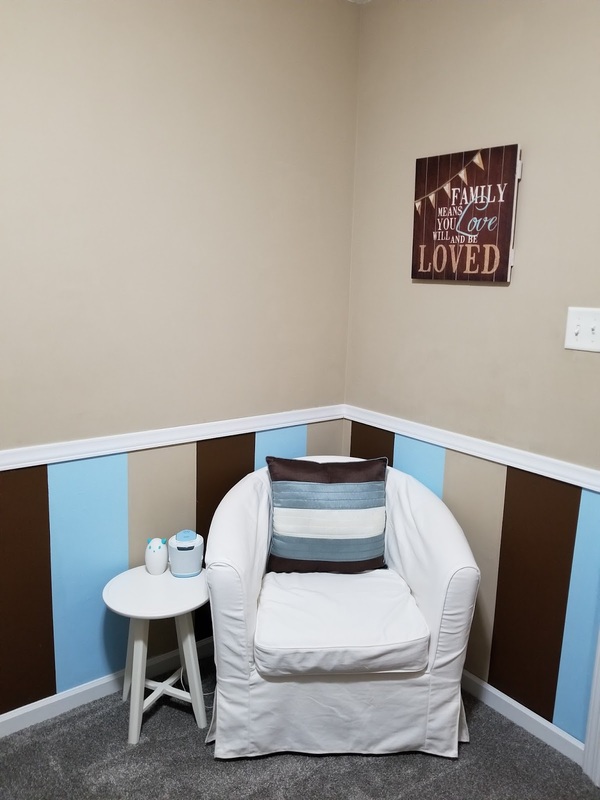 The rest of her furniture was mine from when I was younger, and much of her bedding is made from re-purposing her crib set; for example, the throw pillows were originally her crib bumper pad, and changing table cover. 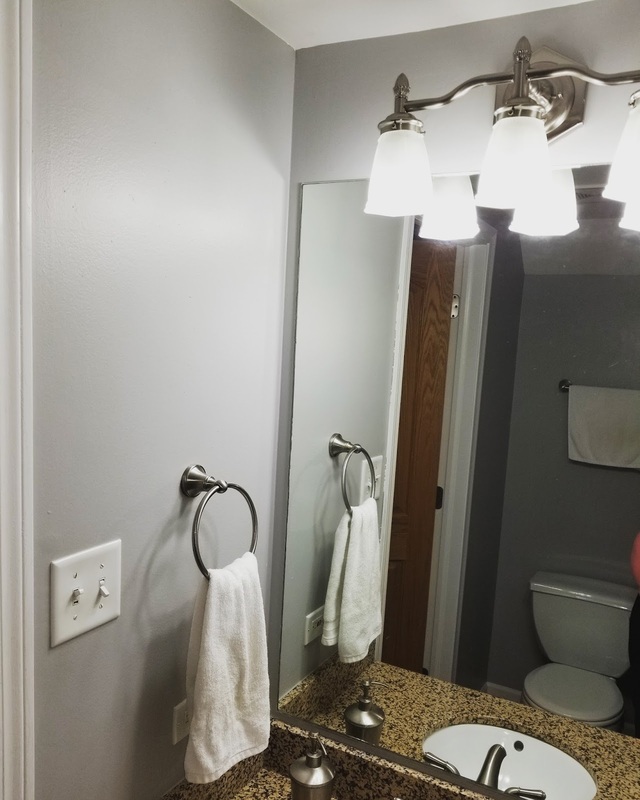 Also, if you look at the first picture, she has a small mirrored vanity area above her dresser, where she can get ready in the morning, since our one full bathroom is pretty small. 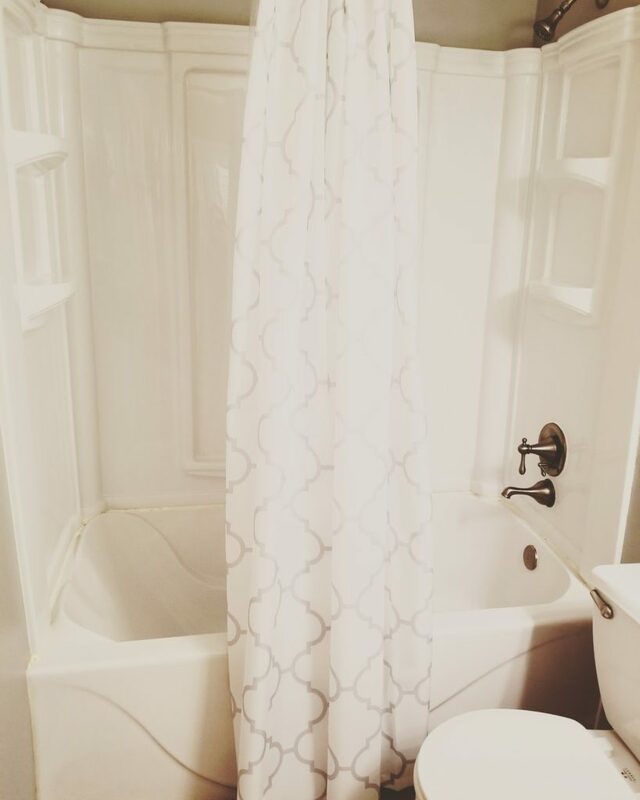 And speaking of our small, one full bath, it’s just down the hall and at least we were able to make it nice. 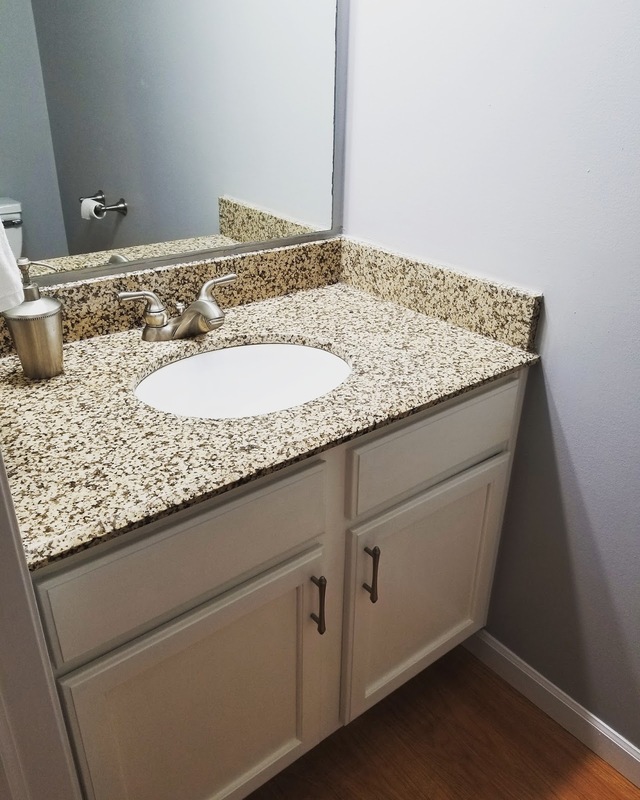 My ex and I had already replaced the original tub for a larger soaker tub, and because I despise cleaning tile, The Guy and I decided to leave it and the solid surface walls alone. 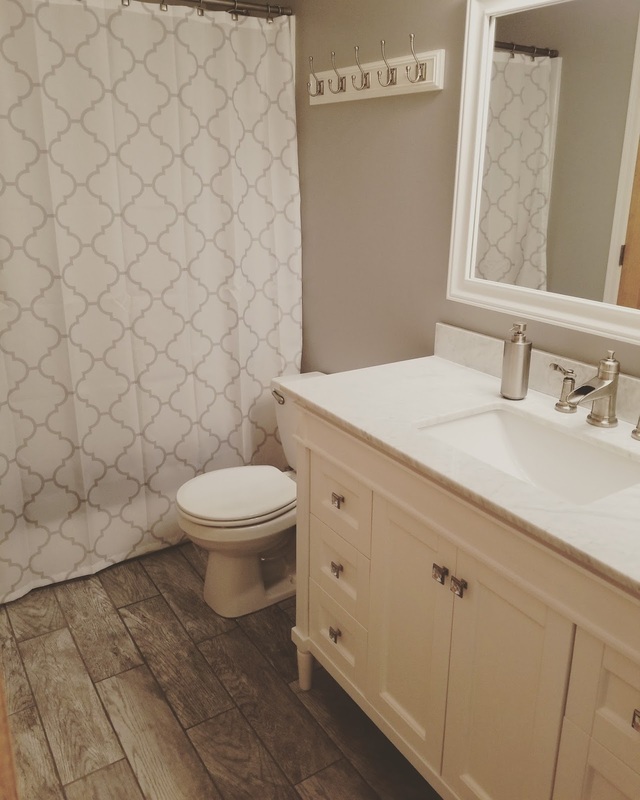 However, the slate tile floor my ex laid way back when, had started popping up in multiple areas, so we replaced it with a gray, wood grain, tile that I am completely in love with. 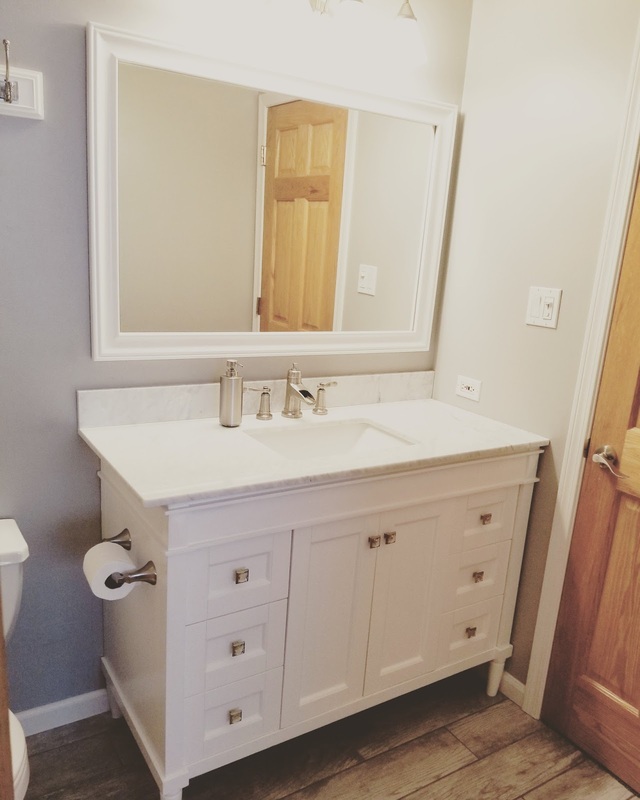 We then installed a stellar clearance sale, much larger vanity, with a marble stone top, that has enough space for everyone to have a drawer or two, and two large shelves for storing extra towels and bigger items. 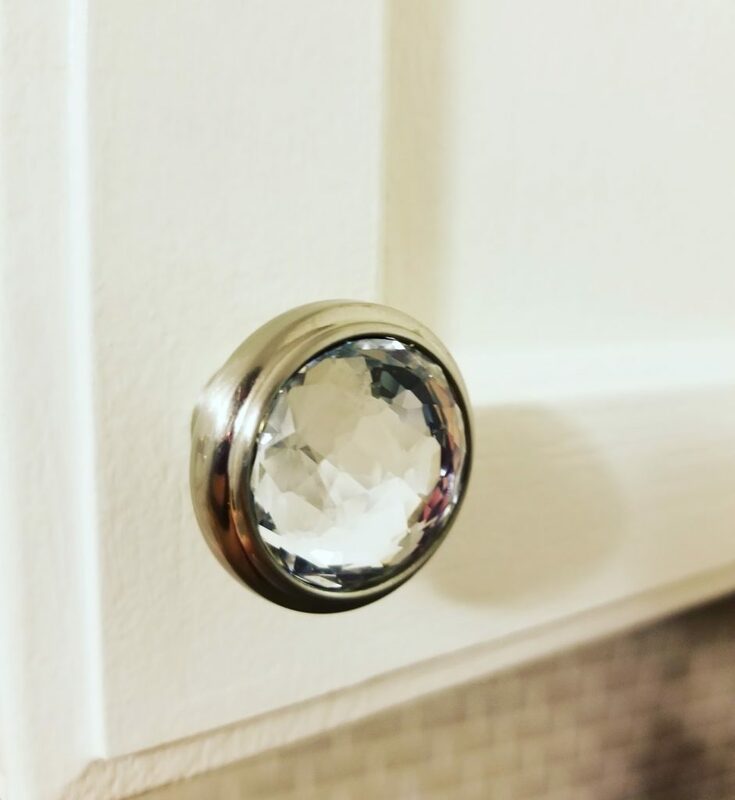 The room doesn’t have a window, so I replaced the pulls that came with the vanity, with glass knobs that bring a bit more light in. 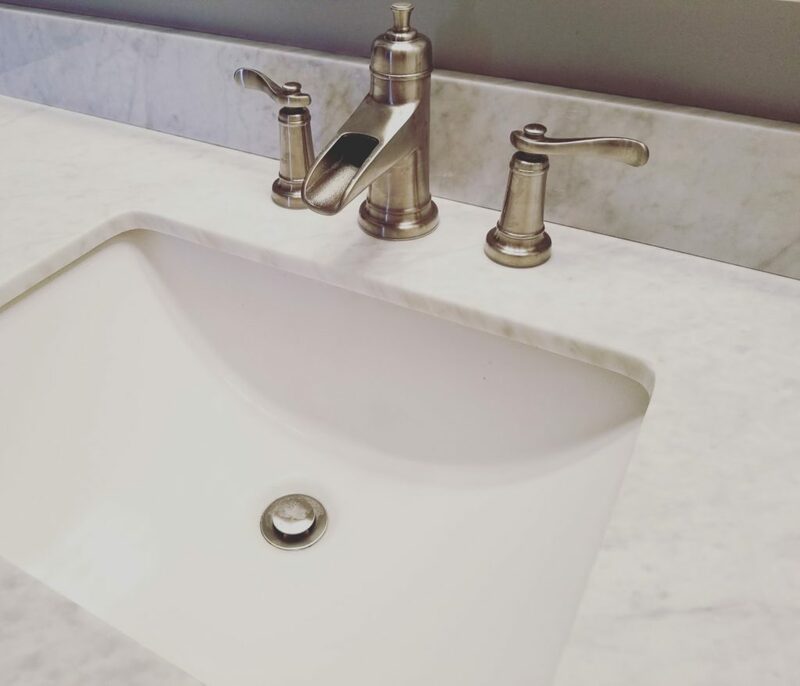 And we reused the previous faucet. 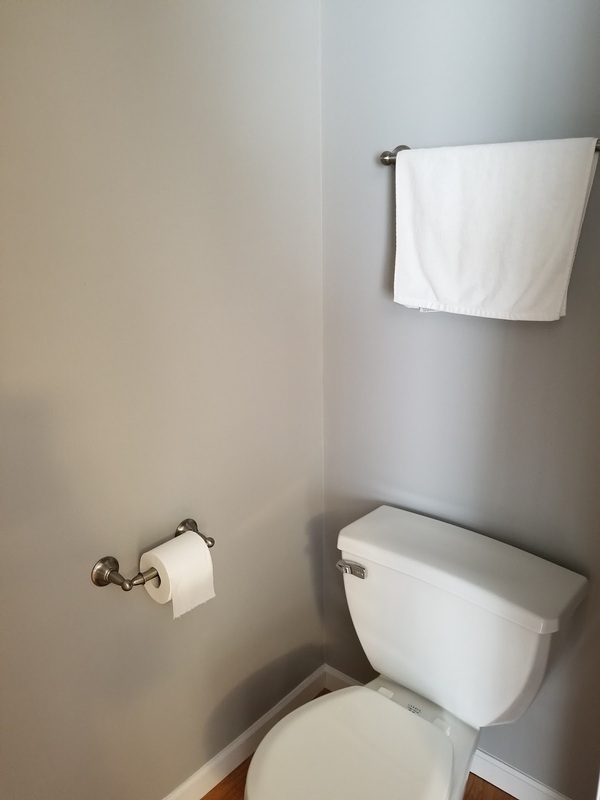 We also kept the coat hook that I had hung up for towels, since it just makes more sense than a towel bar, when hanging multiple towels in a small space. Thankfully there’s also a closet just an arms reach away in the hallway, and I’ve done everything I can to maximize that space! 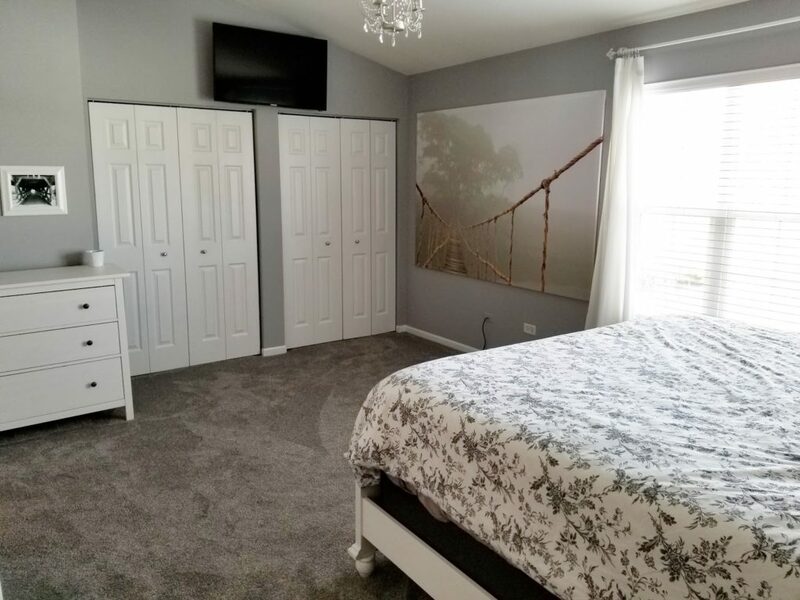 There’s also large laundry closet across the hallway from the bathroom, and last but not least, at the end of the hallway is the master bedroom (which also connects to the bathroom). 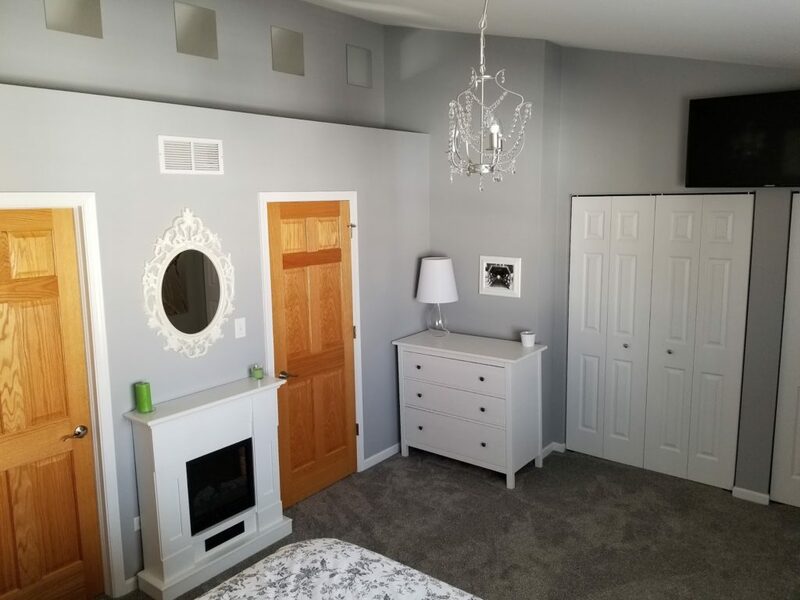 If you remember from the post “Make Money Makeover,” I had redone much of this room myself, but when The Guy came along, we bumped it up with a bigger bed, a fresh coat of paint, new closet doors, and new carpet after the flood. 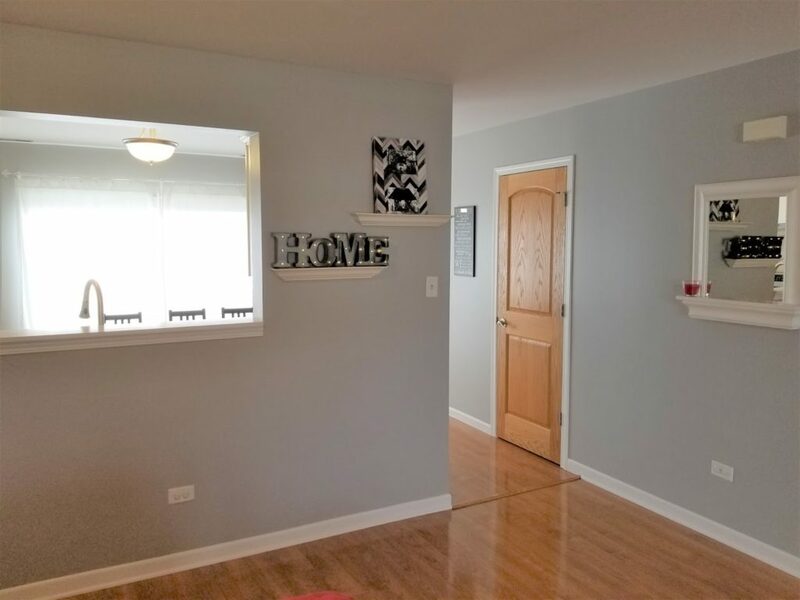 As you may have noticed from the rest of the house, when we painted the trim, I opted not to have the solid oak doors painted too. Personally I really like them! 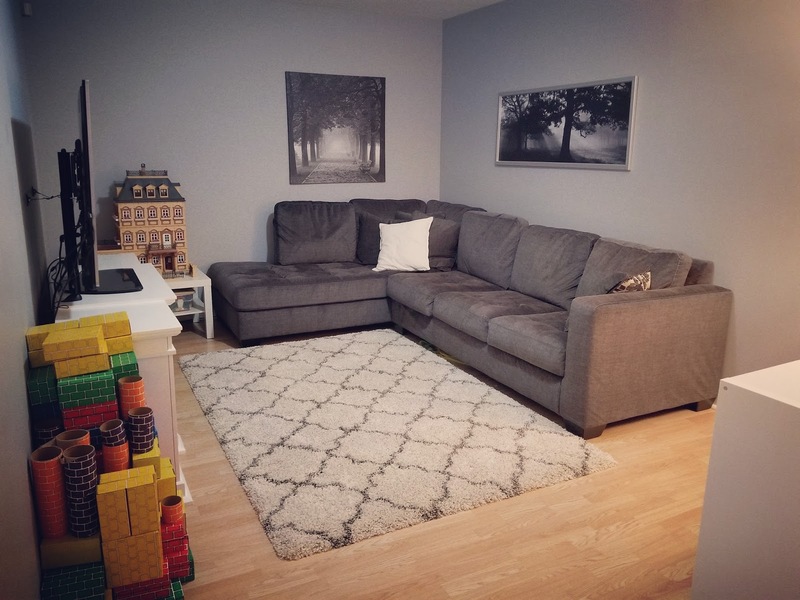 The TV was upgraded to one that I was given when appearing on a talk show last year, and in front of the canvas photo, there’s just enough space for the new baby’s crib to go until he gets moved into The Boy Child’s room. On top of the third floor is a relatively finished attic where we keep all the stuff that American’s tend to hoard, and that my friends, is all! It’s definitely not a big space, but it is big enough to feel blessed, and at the end of the day, it’s our space. I love this space, and I am thrilled to be raising my children in it. Seems like it is plenty big enough for your family. It is also beautiful, you did a great job on remodeling. omg!!! you have such a beautiful house! congrats on finally getting everything done! Absolutely, positively LOVE LOVE LOVE it!!! So beautifully decorated and I loved seeing Frank and George! You are way too humble. 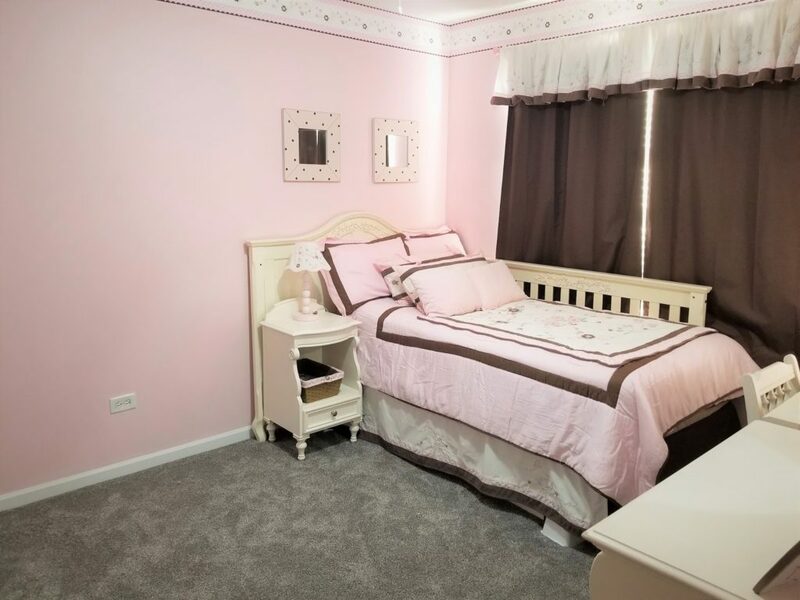 That space is perfect for you and your family and so nicely decorated! 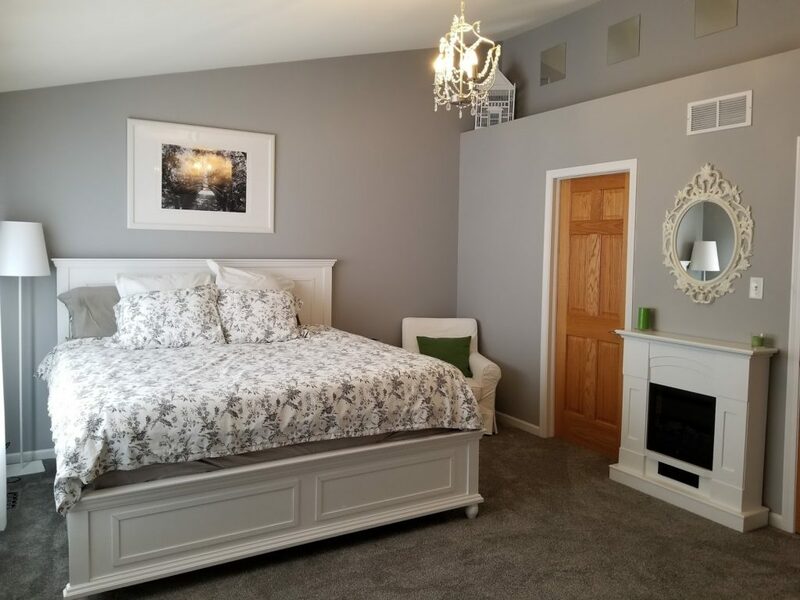 I love the gray/white theme is a lot of the rooms. I love everything!! It’s beautiful! Oh my gosh. I tried 8 different grays before I finally settled on the perfect shade for me. It’s a really hard color. Some look too blue while others look purple and even others look tan. Your house is gorgeous and your neighborhood sounds awesome. 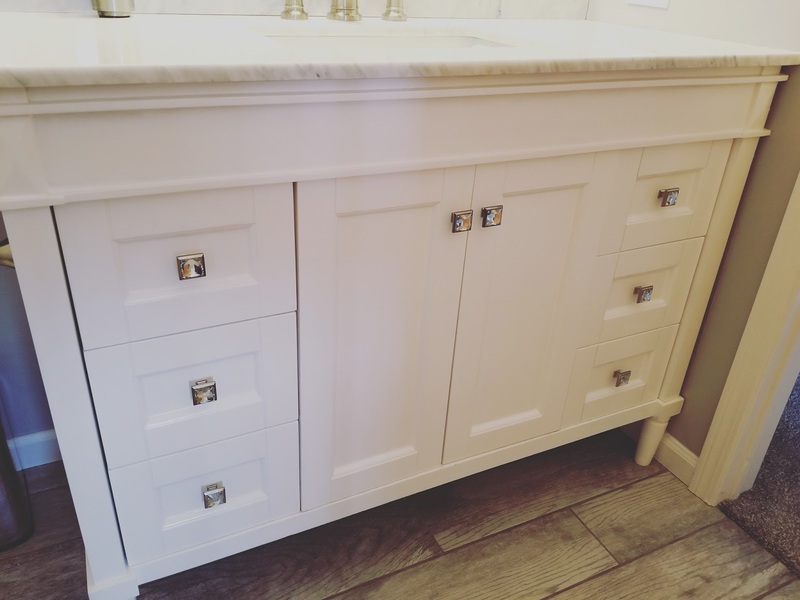 Also, I'm completely in love with the square knobs in the vanity of your full bath. When The Boy Child is older, he will be begging you for your office. Just wait.I know how through all of that, you were proud that the house was the one thing you had. So yeah, I'm glad even though you had the option for somewhere bigger, you decided to stay! Hey!I've recently stumbled upon your beautiful and interesting blog while googling the most stupidest concept ever – that of vanity. I've found out that Chatolic Church condemned human quest for beauty and invented a word for that “vain glory” that got shortened to vanity due to semantic changes and I can't believe some people still today condemn women that invest a lot into being beautiful as “vain”. Idiots!I bumped into your post https://www.yourtango.com/2015276864/6-reasons-im-proud-of-my-plastic-surgery-and-my-vanityAnd when you say vanity do you define it as modern definiton does – “excessively proud in your achievements or appearance” where excessive pride means conceit, arrogance, thinking you're better then all others. Or do you define it like Christians or better to say Quran and Bible where they just condemn human quest for beauty as sin of vanity? Because desire for beauty and investing into your appeappearance is one thing, and arrogance about it another. Modern definition does not condemn any guest for beauty, you can invest how much you want, it just says it's not nice to be arrogant and think you're superior to all others if you're succesful or beautiful. Where religion condemns desire for ebabbeauty and making an effort to be beautiful as “vain glory/vanity” or whatever stupid word they invented.It makes me sick what religion condemns, purely natural things in this case beauty. Beauty is not vanity, beauty is one form of self perception that forms self image that then forms self confidence, and evolutionary psychologists clearly worn and state that desire for beauty is not vanity. Bible invented that word vain glory and then it got shortened to just vanity which actually mean futile. 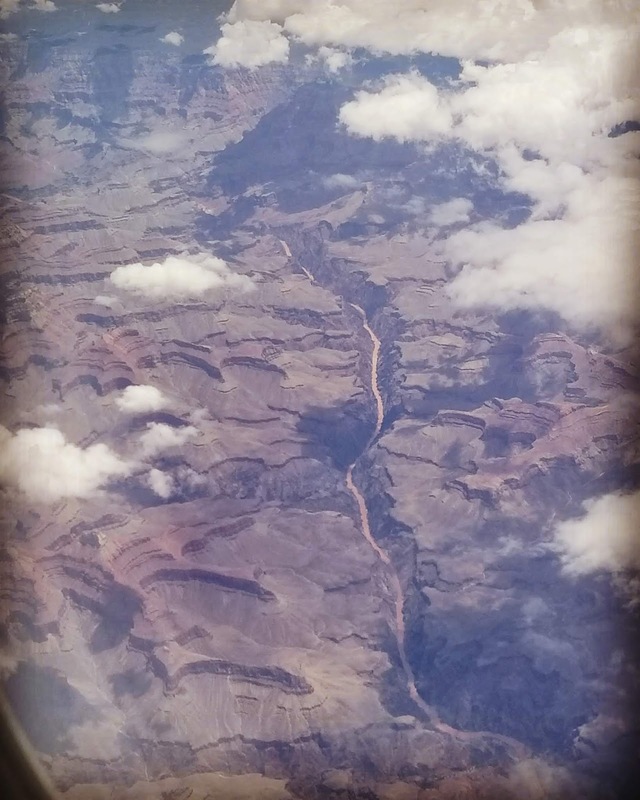 But beauty is part of identity and form self confidence it can never be futile!From book of evolutionary psychologists and psychiatrist Ellen Sinkman “The psychology of beauty”https://inspiyr.com/4-reasons-its-ok-to-be-beautiful/1. We’re Programmed to Desire BeautyBeauty is important to everyone. Even the outstanding Eleanor Roosevelt said “I only wish that I had been prettier.”This is not vanity. Evolution has programmed us to try to look beautiful. Neanderthals mixed vividly colored cosmetics, and sculpted seashell jewelry. Ancient mummies reveal that primitive orthodonture used catgut to straighten teeth and close gaps.Evolutionary psychologists assert that trying to look beautiful is partly about sexual courtship. Looking beautiful is delightful to see, plus it can show skill, intelligence, and ingenuity.Whether or not people who beautify themselves are aware of it, making themselves beautiful has also resulted in bonding them together socially: another aspect of evolutionary survival.